How do you make a good living in an economically depressed region without being under a boss's thumb? We've tried everything and settled on a few tried and true methods. Below, you'll see posts on our blog about starting our own microbusiness. 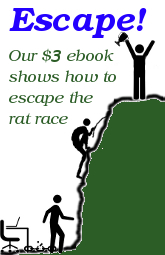 Meanwhile, we've published an ebook detailing our success with quitting our jobs and making a living from the homestead. The book is available over at Wetknee Press for only $3. We've also started doing a lot of blogging over there on microbusiness topics, which is why this part of Walden Effect is a bit out of date. Enjoy! Are you susceptible to bribery? We have an affiliate program at last! "I made a jig and named her Charlotte"
Links: blog/"I made a jig and named her Charlotte" blog/Are you susceptible to bribery? blog/Beech Mountain writer's retreat ... blog/Best homemade chicken waterers blog/Broadforks for everyone blog/Call for chicken articles blog/Cardboard lessons blog/Chicken water blog/Chicken waterer closeout sale blog/Chicken waterer closeout sale, part 2 blog/Chicken waterer photo contest blog/Daffodil farmers blog/EZ Miser: An even better chicken waterer blog/Ebooks vs. paper books blog/Egyptian onion giveaway 2015 blog/Fan mail blog/Flock of five blog/Friendly strangers blog/Fund your journey back to the land blog/Going postal blog/Greg Judy on mob grazing blog/Hauling in the pitchers blog/Homemade chicken waterers in action blog/How to Make Money Homesteading blog/How to make a living homesteading blog/It's a Long Road to a Tomato blog/Joey's kickstarter blog/Journalists tour the farm blog/Lavender Farm and making a living blog/Limited edition heated chicken waterers blog/Limited run of heated chicken waterers blog/Micro-business bloom blog/Micro-niche maverick review blog/Microbusiness Independence, second edition blog/Microbusiness comes full circle blog/More on microbusiness blog/My new cover model (and other book news) blog/November Weekend Homesteader blog/October Weekend Homesteader blog/Plastic pitcher delivery blog/Please help my friend become a NYT bestselling author blog/Pondering old books blog/Postal notes blog/Save on our Modern Simplicity bundle blog/Site updates blog/Small is Beautiful blog/Starting a microbusiness blog/Stumbling homestead podcast blog/The Cows Are Out blog/The Good Life Lab blog/We have an affiliate program at last! blog/We have labels! blog/Where and how homesteaders buy books blog/Win a free homesteading/garden/microbusiness consultation!